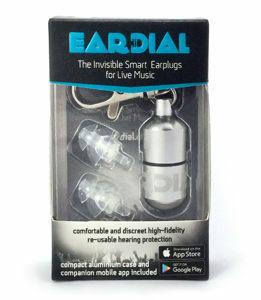 Hear the music and chat with your friends while protecting yourself from harmful sound decibels. Almost invisible when you put them in your ears, no matter your skin color. Wear them comfortably for long hours, even for the most sensitive, with exclusive earwax protection. Easy to store, take out, and carry around at all times. Optional luminescent sticker to find in the dark included. Know the sound level around you, and how long you can stay safely, for iOS and Android. 5% of our profits go to charities on a mission against tinnitus and NIHL (Noise Induced Hearing Loss). Click the button below to grab your EarDial at the discounted launch price!